The mora knife is a beautiful cultural legacy that us Swedes should be very proud of. The Classic series is one of my favorites with it's roots from the 1800's. The clean design and high capability of the knives is hard to beat when it comes to everyday use both in the woods and inside the city. If you'd like to read more about the Morakniv history I'd like to recommend you to take a look at one of my earlier magazine articles by clicking HERE. The 2/0 is the smallest of the Classic knives. Basically it's a miniature of the regular Classic 1. The Classic 2/0's 75 mm long carbon blade is delivered with a black plastic sheath perfect for neck carrying, just add a piece of para cord and hang the knife around your neck. 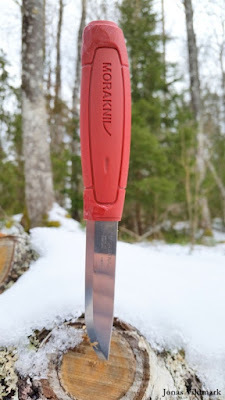 Usually though I carry my Classic 2/0 in the leather sheath that comes with the Morakniv Original 1. The 2/0 is a small knife but you can do big stuff with it. 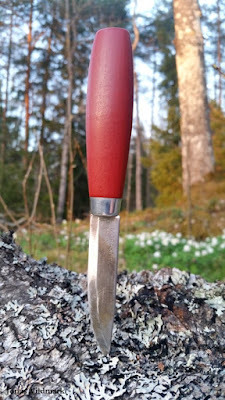 Sometimes I miss the bigger sized handle of the older 2/0 knives delivered from KJ Eriksson up until 2005. These older handles were more compatible to the slöjdknivar offered by Morakniv today. Below you also can see some pics of one of these older 2/0s I've restored and made a leather sheath to. 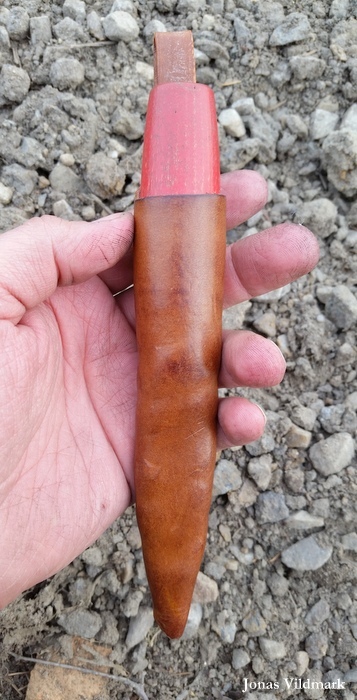 A modern 2/0 with the plastic sheath it comes with. 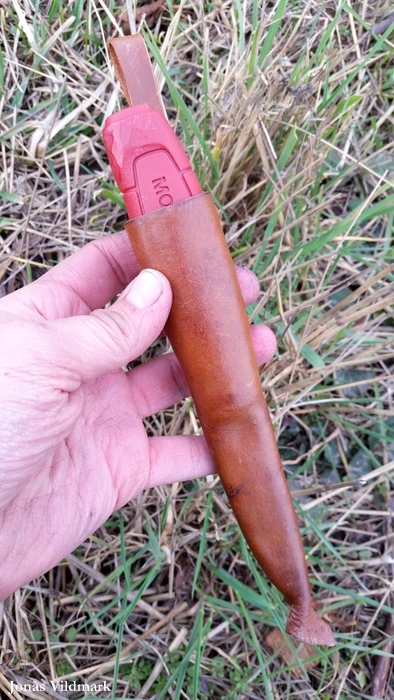 A modern 2/0 in the leather sheath that comes with the model Original 1. Older 2/0 (top) and modern 2/0 (bottom). A older 2/0 I've restored and made my own leather sheath to. 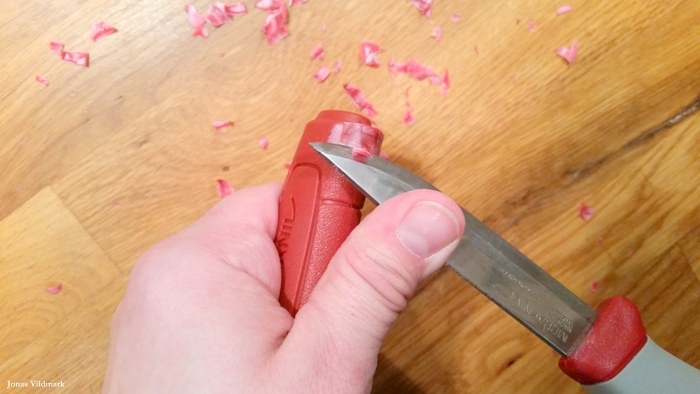 I like proving to myself that a small knife absolutely also can do a big knives job. I'm of the believe that the most important feature of a knife is the hand holding it. And with that philosophy the Classic 2/0 is the perfect example. The humble specs of this knife doesn't seem much but the tasks you can execute with it is impressive. Combine this knife with a good axe and you got a perfect bushcraft set. 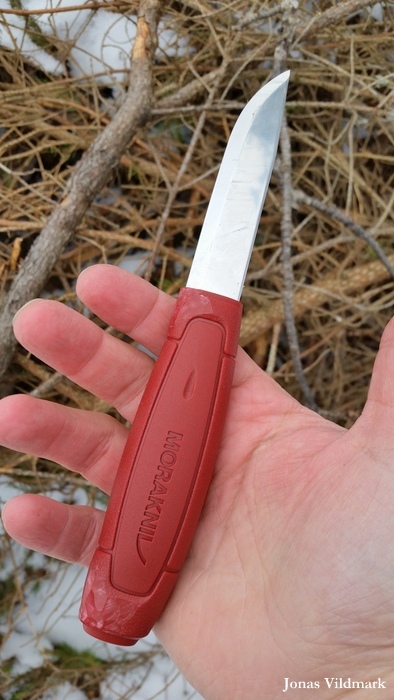 Therefore the Morakniv Classic 2/0 has become one of my most used mora knives. Other post I've published about Morakniv's products you can find by clicking HERE. 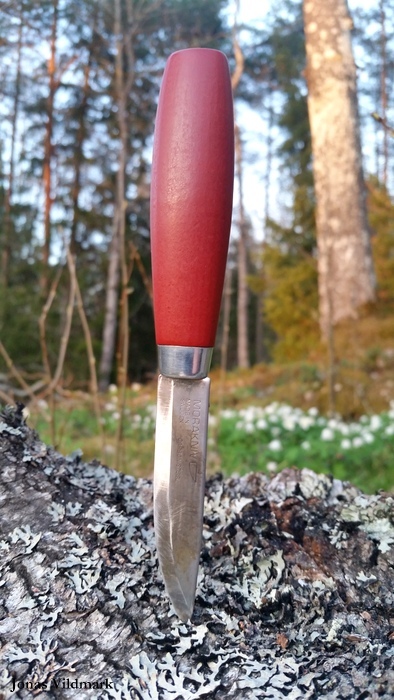 The mora knife is a Swedish cultural treasure. I love the Classic series with their heritage from the 1800's. The clean and functional design offers a outstanding knife and a peace of art. 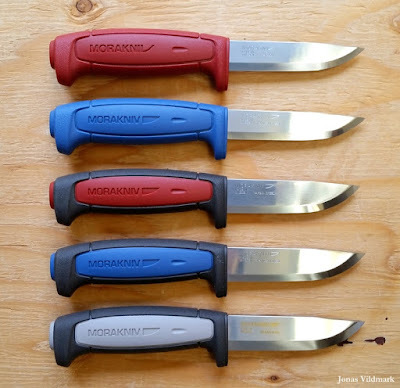 The Classic models feature a wooden handle offering a good grip, but when in very wet and greasy conditions the more resent mora knife models with rubber handles is the way to go. One of my favorites in the plastic category is the Morakniv Craftline HighQ Allround. 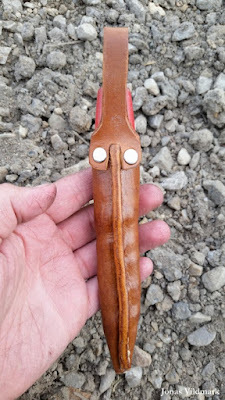 This knife is together with the Companion the successor of the Clipper model. 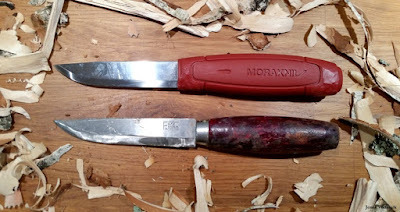 Although the "Clipper/Craftline/Companion handle" isn't symmetric shaped it offers a very comfortable carving knife as well ast the good grip and hygiene offers a great hunting knife. The biggest difference within the "Clipper/Craftline/Companion family" is the shape of the tang and the thickness of the blades. Craftline and Companion feature a long tang and the Clipper used a short tang. 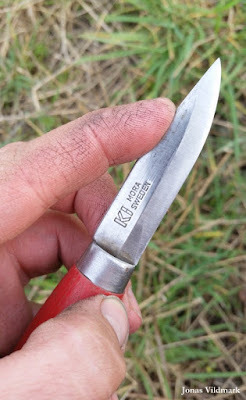 Unfortunately this great knife is being discontinued as we speak. If you're lucky you still can find the Craftline in some stores. Instead the Companion, the Basic and the Pro has entered the stage. Craftline HighQ Allround Knife feature a extra thin, short and narrow blade offering great handling. 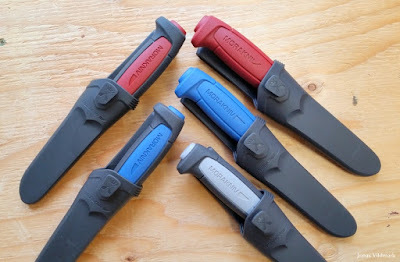 I also like the grey and red rubber and plastic handle. The black and blue stainless steel version Craftline TopQ Allround feature a longer and wider blade. 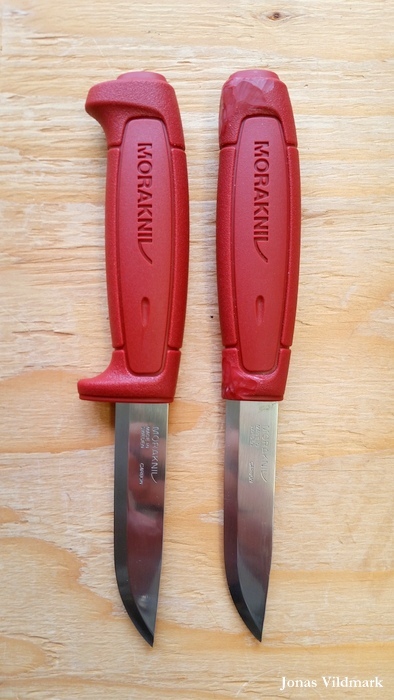 These knives was designed first hand with the carpenter and the plummer in mind. 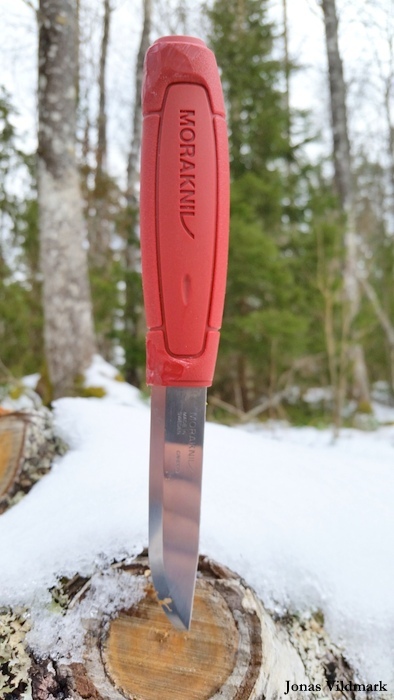 But the Craftline series and especially the HighQ has become the favorite of many bushcrafters all over the world. 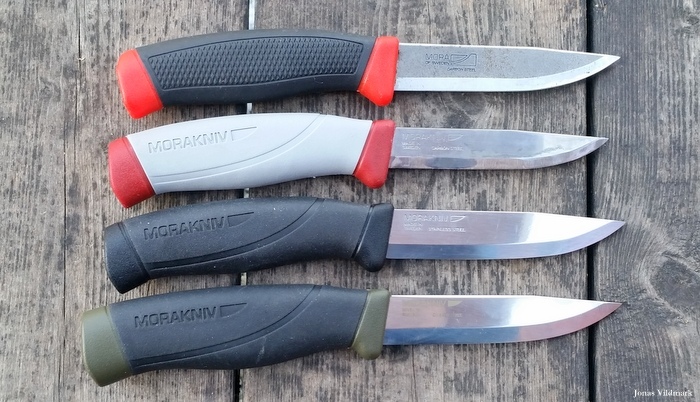 Companion Heavy Duty or the Morakniv Bushcraft Black. So far I've put the Craftline HighQ Allround through most tasks without having the knife failing me once.